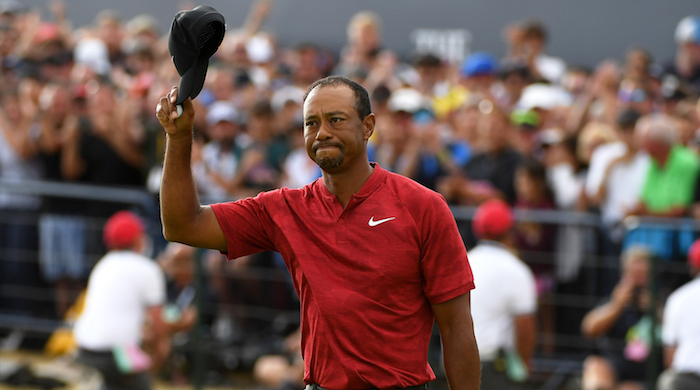 Tiger Woods was happy to take the positives from his Open return but in the quiet, he will reflect on a missed opportunity for his ultimate goal, writes WADE PRETORIUS. Fifteen. It’s a number that’s now spoken about more than any other in golf. Will he or won’t he? On Sunday, at Carnoustie, in the wind and on a brutal course known for ripping the heart out of any foe, he looked like the Tiger of old, the one who made winning look easy. He marched, with that swagger of a decade ago, and even held the solo lead on his own. The focus was palpable. Sitting in front of TV screens around the world, golf watched as Woods twice saved par from greenside bunkers to make the turn in two under par. With the young, new wave being blown away by the gusting breeze, 15 looked nine holes away. Bunkered off the tee at the 10th and a burn waiting to swallow any mis-hit from the sand, another test faced Woods. One that he passed in stunning fashion as he swished violently and then watched as the ball sailed over the burn and trickled on to the green. A statement to all: his back was fine despite multiple surgeries and more importantly, he still had the mental edge. Then, like he did in Florida and the Memorial, he faded. As quickly as he stormed into the lead, he whimpered out. Double at the 11th, bogey at the 12th. The horse had bolted. No 15 would have to wait. ‘Today was a day that I had a great opportunity,’ Woods said. Maybe winning wasn’t as easy as he made it look. But this is a new Tiger, a different Tiger. Make no mistake, he still wants to win but there’s context now. He’s not the supreme, invincible athlete but the dad, the tour legend, the rehabilitated star once riddled with injuries. ‘I know that it’s going to sting for a little bit here but given where I was to where I’m at now, I’m blessed,’ he admitted. While 15 would wait, his children – the only two people who he is determined to show how good he is, and perhaps was – did not. They greeted him beyond the final hole with smiles and hugs. ‘I told them I tried and I said, “Hopefully you’re proud of your pops for trying as hard as I did,”‘ Woods said.